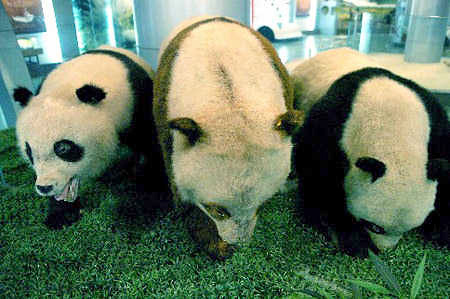 China Wolong Giant Panda Museum was constructed in 1999 in the famous Sichuan Wolong Panda Reserve. This national reserve is home to about 150 pandas. The Museum was built to celebrate one of China's most enduring symbols. 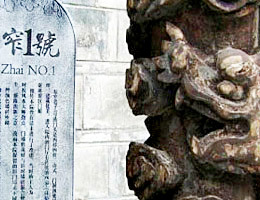 The central government invested 20 million yuan in the project and it was first opened to the public in May 2002. The complex is over 4000 square meters (1 acre) and has become a popular destination for nature and animal lovers. The exhibition area of the museum is divided into sections and designed to teach visitors about every aspect of the giant panda, its history, present, and future. 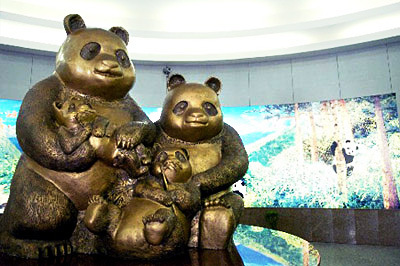 There is an introduction hall to acquaint visitors with the panda and its plight, an environment hall with a real-life and video replicas of the panda's natural living environment, a "living hall" that duplicates the life of pandas with fake plants and specimens of pandas, and a hall dedicated to the protection and continued success of panda preservation and breeding. With stereos unobtrusively playing sounds of wind and rain, visitors have the feeling of wandering in the primitive forests. The visit will be "ordered" as you like. By pushing a button you can choose to know more about the theory of pandas' evolution, listen to the shouts or murmurs of pandas, or watch how pandas peacefully coexist with their environment. This is the only museum of its kind in the world. It is a mega-center for learning about this awesome species and makes an ideal place to take a family on a fun and educational trip.